I’ve written in the past about the unusual timezone used on Australia’s Lord Howe Island. But it’s not the only Australian location with an unusual timezone. Norfolk Island is another. 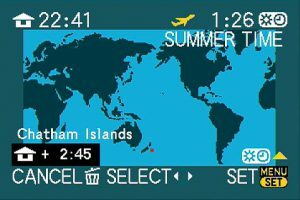 On Lord Howe during summer the timezone offset is GMT+11: the same as Sydney in summer. 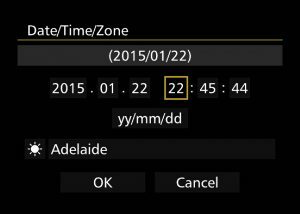 During the rest of the year it’s GMT+10:30 (which is the same as Adelaide uses in summer). Although Lord Howe Island’s timezone isn’t supported by any cameras I know of, the above equivalents are. Norfolk Island is a little trickier! It uses the offset GMT+11:30 throughout the year (no Summer Time). If you’re on Norfolk Island and using a camera with a GPS that supports keeping the camera’s time synchronised, you’ll probably need to turn off the auto-synchronisation. I’m not aware of any cameras that have a timezone matching GMT+11:30. The closest ones are either the Solomon Islands (GMT+11) or Wellington (GMT+12). Choose either one, and whenever the GPS updates the clock you’ll be exactly half an hour off. 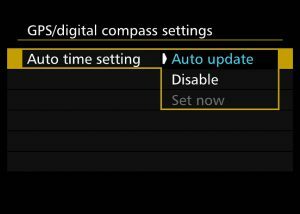 In situations like this my approach is to turn off auto-sync, use the manual “Set now” function (which is accessible when the GPS has locked onto satellites), then manually adjust the time. By first choosing a timezone such as Adelaide with Summer time (GMT+10:30) you can easily shift the time by an hour without touching the minutes/seconds. You only need to do this occasionally to be sure that each of your cameras’ times are accurate to within a second, and thus all your photos will “line up” when viewing them later. You can use this procedure with almost any unsupported timezone, as long as you know what the actual GMT offset is for the time of year you’re visiting. Mind you, there are some unusual ones which make it tricky, such as New Zealand’s Chatham Island (45 minutes ahead of Auckland). 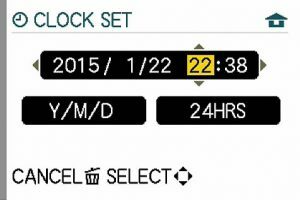 At least some Panasonic cameras support this timezone: Canon cameras don’t. Unlike most cameras, smartphones such as an iPhone have support for almost all timezones and thus you’ll probably find that the photos from these devices will already have the right local time. Timezone offsets keep changing. For example as of October 2014 some zones in Russia changed the way they deal with daylight saving. Of course I only know this because I have some work coming up there and went checking. Luckily for me, during that time of the year the timezone offset for all the places I will be working in happens to be the same as at home. But I’m glad I checked. When travelling to a new location it doesn’t take long to check the timezone details, and it’s then one less thing you have to think about when you arrive at the location. Then you can concentrate on making photographs and experiencing the trip without having to clean up a mess on your computer later. Now it’s time to move on to other topics! date/time, GPS, Lord Howe, Norfolk Island. Bookmark.